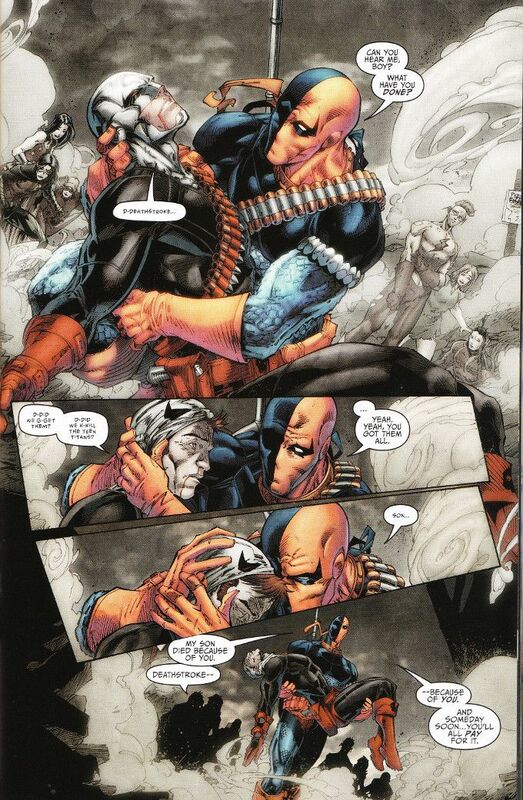 Slade Wilson is the greatest assassin on Earth - a position he earned by being wise enough not to hold grudges. Yet even his professionalism was tested when his eldest son and heir apparent, The Ravager, was killed during his combat with the original team of Titans. Many years have passed since that day but Slade has not forgotten the debt The Titans owe him. Now, they will make amends for what they did - one way or the other! Reluctant as I am to encourage the myth of the invincible Slade Wilson (a Winickian conceit that's somehow grown in power since the ridiculous Identity Crisis) I found myself enjoying Titans #11 even as I wished for an explanation as to just how the heck Deathstroke could abduct Wally West unseen in a public space without his friends noticing. "But whatever", as the late great Mako would say. Dan Abnett's script (based on a story by hmself, Priest and Benjamin Percy) doesn't waste time with such trivia. It's too busy reaffirming one of the greatest villain/team rivalries in comics history for a new generation of readers and showing the circumstances that led to Deathstroke's grudge against The Titans in the reality of Rebirth. To Abnett's credit, he does this without any lengthy exposition dumps, conveying just enough information to move the story forward and editorial boxes (oh, how I've missed those!) informing the reader where they can read the full details. The artwork is up to the usual standard of Titans' art team. Brett Booth is a wonderful fight choreographer but still has an unfortunate tendency to capture his characters with awkward expressions. Norm Rapmund keeps his inks delightfully light, allowing the bright colors utilized by Andrew Dalhouse and Carrie Strachan to shine all the brighter. Final Analysis: 8 out of 10. A solid start.